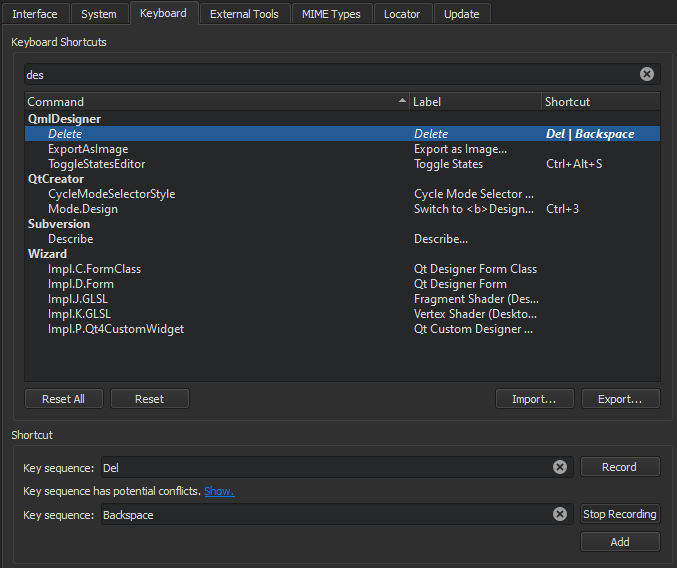 Qt Design Studio provides various keyboard shortcuts to speed up your development process. In addition, you can specify your own keyboard shortcuts for some functions that can be easily performed with a mouse, and therefore do not appear in menus or have default keyboard shortcuts. For example, selecting and deleting words or lines in an editor. To view all functions available in Qt Design Studio and the keyboard shortcuts defined for them, select Tools > Options > Environment > Keyboard. The shortcuts are listed by category. To find a keyboard shortcut in the list, enter a function name or shortcut in the Filter field. The shortcuts that are displayed in red color are associated with several functions. Qt Design Studio executes the function that is available in the current context. If several functions are available for the same shortcut at a time, there is a conflict and Qt Design Studio cannot execute any function. A keyboard shortcut might also conflict with a shortcut that a Window manager uses for its own purposes. In that case, Qt Design Studio shortcuts do not work. Typically, you can configure the shortcuts in the window manager, but if that is not allowed, you can change the Qt Design Studio shortcuts. Select Tools > Options > Environment > Keyboard. Select a command from the list. Enter the shortcut key you want to associate with the selected command. Select Record, press the keys to use as the keyboard shortcut, and select Stop Recording when you are done. To revert to the default shortcut, select Reset. To import a keyboard shortcut mapping scheme, click Import and select the .kms file containing the keyboard shortcut mapping scheme you want to import. To export the current keyboard shortcut mapping scheme, click Export and select the location where you want to save the exported .kms file. The following tables list the default keyboard shortcuts. They are categorized by actions. Where the number is the number of the output pane. The second press extends the selection to the parent block. To enable this behavior, select Tools > Options > Text Editor > Behavior > Enable smart selection changing. You can use the following keyboard shortcuts when editing QML files in the Design mode.